Today's guest is a success coach and business strategist who helps people create businesses and build a lifestyle that allows them an unimagined sense of freedom, flexibility and fulfillment. She works individually with a select number of clients to help them re-imagine success in their personal and professional lives. She also runs a group program and is working on a new book that will help you take your One Step Outside the 9 to 5! Fun Fact: Anna’s business One Step Outside comes from the phrase, “One step outside of your comfort zone.” – It’s about creating a lifestyle that works for you. Not just the big dreams, but also ensuring you’re able to keep on top of your finances as well as stay connected with your family. 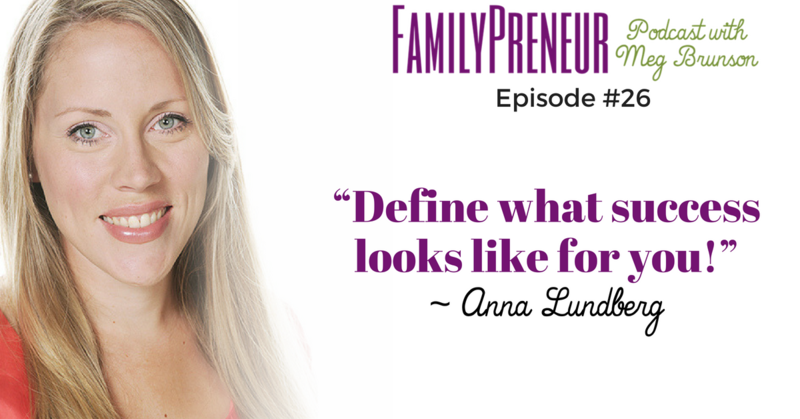 Anna worked at Proctor & Gamble prior to opening One Step Outside and the contacts that she made there were priceless in her being able to develop her business. Although she loved working there, the work she was doing there wasn’t what she wanted to do for her career. She says she was molded to be the “good girl” – went to the ‘right’ university, studied the ‘good’ courses because she would be able to get a good job, and essentially just put her head down and kept at it this way until she took a 3 month sabbatical to do some soul searching. The biggest critical voice for Anna when she was considering this immense change in her life was her own. There wasn’t one moment where Anna knew she had made the right decision, it was actually several moments spread out over years. One of the keys to having reasonable expectations for yourself is to be able to separate the amalgamation of the best parts of peoples’ lives that you see on social media. It’s important to remember that it’s not a single person who’s getting married, having three kids, going on amazing vacations, at the top of the ladder at work, is working out 4 hours/day, and has an amazing relationship with everyone in their immediate and extended families. Anna is a success coach and business strategist who helps people create businesses and build a lifestyle that allows them an unimagined sense of freedom, flexibility and fulfilment. She works individually with a select number of clients to help them reimagine success in their personal and professional lives. She also runs a group programme and is working on a new book that will help you take your One Step Outside the 9 to 5. Last week, I welcomed business partners Anna Lozano and Lindy Sood to the show to discuss their business, Love Powered Co. and their empowering Affirmation cards made especially for the next generation of mindful leaders! Next week we'll meet Dena Patton, founder of the Girls Rule Foundation and an award winning business coach, speaker, activist, philanthropist, and best selling author who works with leaders, women entrepreneurs and world changers. Dena deeply believes in the power of BIG dreams, philanthropy, greatness and entrepreneurship, and her mission is to ignite greatness in women, girls and leaders worldwide. So that you don't miss the value packed episode Dena brings us next week, double check and ensure that you're subscribed to the podcast now!